Early in the season, cinnamon fern develops tall spikes that grow from the middle of a vase-like clump of arching fern leaves, or fronds. The spikes start off dark green and gradually turn cinnamon-colored, giving this large fern its name. Ferns are coming up in force these days, now that it’s May and we’ve finally had days – or was it weeks? – of rain. Some of our biggest and most common native ferns, cinnamon fern and interrupted fern, have been unfurling from their fiddleheads. “Big ferns, big deal!” many of us might think. Ferns all tend to blend together in our minds, and we’re not used to telling them apart. But why not get acquainted with them? This time of year is the perfect time to see how easy it is to recognize at least some of our most common native ferns, starting with the big ones. Make a point of looking for big ferns when you walk Westborough’s trails, especially in damp areas. Cinnamon fern (Osmunda cinnamomea) develops tall, cinnamon-colored spikes that grow from the middle of a clump of fern leaves, or fronds. The spikes start off dark green, but very soon change color and look for all the world like giant cinnamon sticks. They shrivel up later in the summer. Interrupted fern (Osmunda claytoniana) has leaves or fronds that are “interrupted” in the middle by several pairs of odd-looking small, thick leaflets that start off dark green but soon turn dark brown. These brown parts eventually wither away, leaving a gap in the frond. Royal fern (Osmunda regalis) develops special branching clusters at the top of its fronds, and these clusters are shaped somewhat like a royal scepter, or maybe a crown. The clusters are green at first but later turn brown. Royal fern is also sometimes called flowering fern because the clusters can look a bit like flowers. Ostrich fern (Matteuccia struthiopteris) has large leaves or fronds shaped like ostrich feathers – rounded and widest at the top and gradually tapering to the base. In our area, we’re most likely to find ostrich fern in someone’s garden, because it prefers sweeter soils (from limestone) than our typically acidic eastern Massachusetts soil. (But if you travel to Vermont or western Massachusetts, look for ostrich fern in the woods there.) Somewhat like cinnamon fern, ostrich fern also develops brown clubs in the middle of a clump, but these are short and shaped like ostrich plumes. At this time of year, interrupted fern has leaves or fronds that are “interrupted” in the middle by odd-looking, thick leaflets that start off dark green but soon turn dark brown. These brown leaflets eventually wither away, leaving a gap in the frond. Okay, say you’ve found some big ferns in the woods. If you don’t see any cinnamon sticks, interrupted leaves, royal scepters, or ostrich-plume fronds, how can you tell which of these four big ferns you’re looking at? First, you can take some cues from the environment where the big ferns are growing. If the fern has “wet feet” because it’s actually growing out of the water of a swamp, stream, or pond, it’s probably either royal fern or cinnamon fern. Royal fern is the most water-loving of these ferns, and you’ll find it in the wettest spots, or in spots that are wet during much of the year. Cinnamon fern can grow either in water or just near wet areas. Next, look carefully at the fronds. Royal fern has widely spaced leaflets on its fronds, and the leaflets have widely spaced sub-leaflets. This spacing gives the fronds an airy look that you can notice even from a distance. 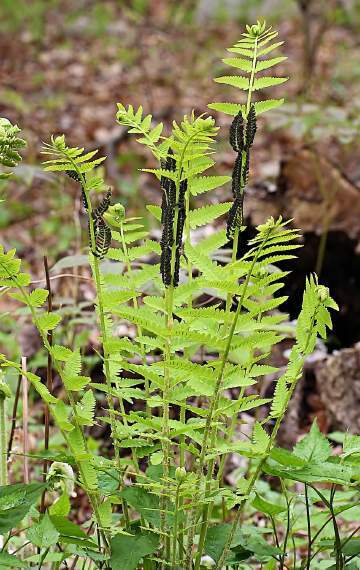 Cinnamon fern looks quite different, and more traditionally fern-like, with densely spaced leaflets that are deeply cut into many lobes. Cinnamon fern has a denser, lusher look. 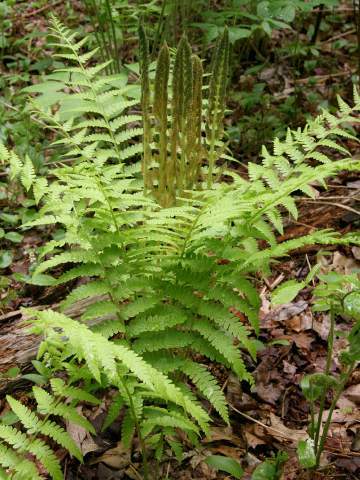 If you’re looking at big ferns that are growing on dry or damp land, they might be either cinnamon fern or interrupted fern. The fronds of these two look very similar, much the way we usually think of ferns as looking. And the two do often grow together. But noticing their environment might help you make a good guess about which one you’re seeing. Interrupted fern likes drier sites, such as rocky hillsides, and cinnamon prefers low, damp spots. Again, now take a close look at the fronds, especially the places where the leaflets attach to the main stem. Cinnamon fern often has “hairy armpits” – small tufts of cottony hairs where the leaflets join the stem. Interrupted fern doesn’t have these tufts. And of course, if the fronds are shaped like ostrich plumes, it’s ostrich fern. What about the fiddleheads we see in the woods as these bigs ferns (and others) come up? Are they edible, like the fiddleheads sometimes sold in grocery stores at this time of year? The answer is no. Only the fiddleheads of ostrich fern are edible, and those are what’s found in grocery stores. Although Westborough’s woods are filled with fiddleheads that look pretty much the same as the store-bought variety, these are not edible. Today it’s known that many ferns contain chemicals that are toxic or even cancer-causing, so it’s best not to sample fiddleheads you find in our woods. Ferns aren’t even on the menu for most insects and other animals. Even deer avoid eating ferns and instead munch other native plants. In fact, it’s sometimes said that if your woodland floor is open and filled with ferns, you know you have a substantial deer population that’s eating all the other undergrowth and small samplings. Besides containing chemicals that protect them from being eaten, ferns prosper because they can live in the shade created by other plants. Ferns are able to use many different wavelengths of light, thanks to a unique chemical receptor that they have. Ferns are limited by their need for water for sexual reproduction. They have no seeds. Instead, those special parts that we see in big ferns at this time of year – the cinnamon sticks, the interrupted leaves, the royal scepters, and the plume-shaped clubs – produce millions of spores that travel far and wide on the wind. When the spores land in a favorable place, they produce tiny, ¼-inch, heart-shaped green plants that make sperm and eggs. Water – sometimes only a thin film of water – is needed for the sperm to swim to the eggs. Once the two join, a new fern plant grows. Ferns get around their need for such complexities by spreading by their underground stems, or rhizomes. As the rhizome grows, it produces new fern plants that are genetically identical. For this reason, large colonies of ferns can quickly grow in a favorable location. You can find ferns in all of Westborough’s conservation areas, but you’ll undoubtedly spot some big ferns if you attend the nature walk with biologist Scott Shumway of Wheaton College. this Sunday, May 27, 1:30 p.m. at Wile Forest and the Libbey Reservation in Westborough.